XNurbs uses one simple UI to solve all kinds of problems for NURBS creations – It virtually has an unlimited capacity for solving NURBS and generating high-quality surfaces based on energy-minimization method. Its energy-minimization algorithm produces high-quality surfaces that are analogous to a physical model: when a wooden batten bends, it always assumes a shape that minimizes its bending energy to form a smooth curve. There are numerous operations or scenarios how XNurbs could be used. Since it is impossible to demonstrate all of them, the followings are just some examples. From users’ viewpoint, all operations or scenarios are the same: users just select curves or points, XNurbs will generate the smoothest NURBS surfaces that satisfy all the inputted constraints. Unlimited capacity for solving NURBS: Its optimization algorithm can solve virtually any NURBS surface on the fly (regardless of how complex the constraints are). High-quality surfaces: Its optimization algorithm uses energy-minimization method to generate the smoothest NURBS surfaces that satisfy all the inputted constraints. Easy-to-use: it uses one simple UI for all kinds of NURBS modeling. 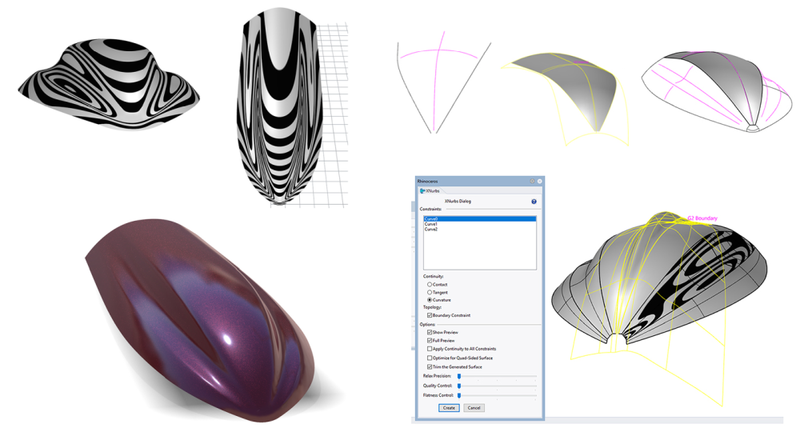 Native CAD surfaces: XNurbs generates native CAD surfaces, i.e., trimmed/untrimmed NURBS surfaces, which can be directly used for any CAD modeling operations.